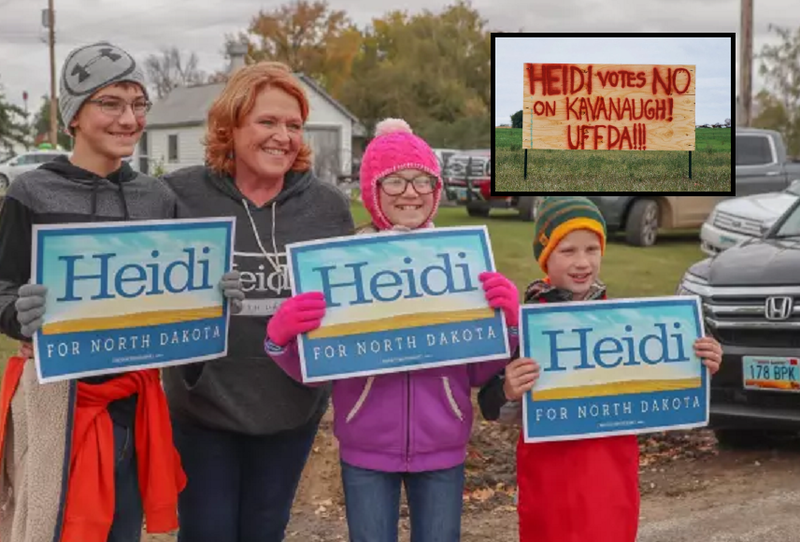 Given that the 48-50 vote result on Supreme Court Justice Brett Kavanaugh was known beforehand, one could be left to wonder why North Dakota’s Democratic Senator Ms. Heidi Heitkamp decided to follow along party lines. Unlike her party companion Mr Joe Manchin who knew that he would never get re-elected by voting against a Trump pick for the Supreme Court at this state of the race, Ms Heitkamp decided to go with her ‘body language’ interpretation of Mr Kavanaugh during the questioning by Democratic senators, as she famously explained on ’60 minutes’ (see hereunder). However, by now, rolling averages show Ms. Heitkamp’s in the most danger, by far, of any Trump-state Democrat. Everywhere on fields and front yards, homemade signs stating ‘Heidi votes no on Kavanaugh’ are going up, a troubling sign which could spell disaster for Democrats and guarantee the Republicans keep control of the Senate for the next two years. Related coverage: <a href="https://thegoldwater.com/news/39067-Midterms-Will-Millennials-Go-Out-And-Actually-Vote-This-Time-Video"> Midterms – Will Millennials Go Out And Actually Vote This Time? (Video)</a>. However, in the current political climate, the Democratic Senator admits “that’s the way it just goes,” as voter, aftera voter told her about the polarizing Supreme Court battle as she made her way around the towns, visited in the past week. As Republicans know, not only did they deliver a conservative majority on the Supreme Court but they at the same time galvanized conservative-leaning voters in a Midterm campaign that previously had been dominated by a surge in Democratic enthusiasm.